Cook said that her experience at IDE provided her with knowledge of campus issues that will help her better realize the goals of C3I. 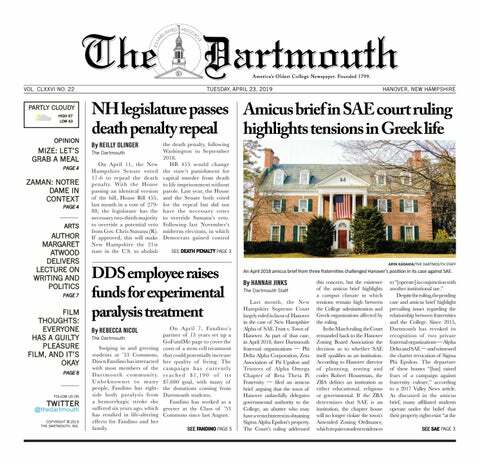 In her previous role, Cook’s responsibilities included supporting faculty hiring and evaluating Dartmouth’s faculty hiring processes. “Being able to go through that in IDE and become very aware of what’s happening on our campus allowed me to take initiative in C3I,” Cook said. IDE vice president Evelynn Ellis said she expects collaboration between her office and the C3I. She emphasized that her job at the IDE, which is to foster inclusivity and equity on campus, is inseparable from Cook’s current responsibility to improve the Dartmouth campus climate. In the three months since C3I’s launch, the Initiative has focused on three projects to implement its goals: the drafting of the unified sexual misconduct policy and procedures, departmental reviews and mandatory Title IX training for faculty and staff. Last week, the latest draft of the unified sexual misconduct policy and procedures was published on C3I’s website, where students, faculty and staff can provide feedback until April 9. Once the feedback has been collected, various departments will vote to approve the new policies and procedures later this month and into May. The departmental climate reviews — led by University of Michigan psychology and women’s studies professor Abigail Stewart and Dartmouth engineering professor Vicki May — are set to begin this week. Senior associate dean of student affairs Liz Agosto said that the student affairs office helps to create drafts for the unified sexual misconduct policy and procedures by communicating with undergraduate students and collecting feedback from them. She added that she looks forward to collaborating with Cook on more of C3I’s projects. Title IX coordinator Kristi Clemens said that under the C3I, the Title IX office will add a new staff member. The Title IX office has also worked together with C3I to implement online mandatory Title IX training for faculty and staff. Clemens noted that C3I might be more effective at implementing projects that address campus climate issues because it has a higher priority in the organizational structure of the College’s administration. Cook said she hopes to use her new leadership position to further advance the mission of the C3I. She noted that she plans to “glean a lot” from a National Academies of Sciences, Engineering and Medicine report titled, “Sexual Harassment of Women: Climate, Culture, and Consequences in Academic Sciences, Engineering, and Medicine” to understand the climate of higher institution. According to Cook, further specific projects for the C3I have not been created. She added that in creating future projects for C3I, the initiative will include input from Dartmouth community members. According to Ellis, the hiring for Cook’s replacement at IDE is currently ongoing.